Born between February 19 and March 20 is the twelfth and last sign of the Zodiac, Pisces. A Feminine, Mutable, Negative, Water sign that is symbolized by two fishes swimming in opposite directions. This very well explains the basic Pisces trait of living in two worlds, one being the reality and the other one which is built up on various dreams and thoughts. Pisces are governed by a duality, a struggle of the spiritual soul within the physical body. 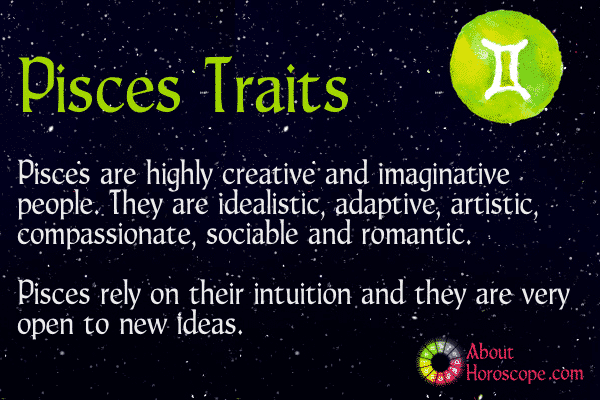 Pisces are deeply creative and artistic, with enhanced intuitive abilities. Ruled by Neptune, planet of inspiration and imagination, Pisceans are one of the most creative signs of the Zodiac. On the flipside, Pisces are easily lied to because they can be gullible. No matter how often they are led astray by empty promises, they keep the faith and push on toward their personal ideal. Their dreamy and impractical natures can be a source of distress to those close to them. Being both optimistic and cynical, Pisces sometimes find it difficult to make up their minds on any issue. Pisceans are well known for their soothing stability. Even in the worst of storms, a Piscean will never panic and will maintain his poise. He has a good intuition and if he tells you not to go out of the house on a particular day, it is better to stay indoors. Pisces is the last sign of the zodiac and represents death and eternity. It has a mixture of the qualities of all the other zodiacs making it quite difficult to truly understand a Pisces. He is a great organizer and pays attention to details (like Virgo), has a fair judgment (like Libra), is sympathetic and moody (like Cancer), honest and kind (like Sagittarius), loves people and attention (like Leo) and is analytical (like Aquarius). At the same time, he talks fast and expertly (like Gemini), is passive and stubborn (like Taurus), can know your deepest secrets (like Scorpio), shows dedication to duty (like Capricorn) and overflows with optimism, innocence and zeal (like Aries). They never run out of compassion for the sick and lonely. Their shoulders are ever ready to cry on. They never judge people, understand and accept them just as they are and will always be there if the need arises. Mysterious, and often difficult to gauge, Pisces man is attractive to many but close to a few. The Piscean’s youthful attitude is reflected in his physical appearance. He often looks younger than his years due to a good-humored and optimistic attitude in life. Smiling keeps wrinkles at bay and good for the health. He does not seek wealth or power. He is on a quest for truth and making the world better for others. Although the Pisces does not seek leadership, he can be found leading a movement for a cause that he is passionate about. He is very passionate and involved with issues they care about, even if they appear cool on the outside. The calm, collected facade of a Pisces man often hides his passionate and sensitive inner turmoil. He possesses a strong and vivid imagination, expressing his thoughts through writing, dance, or song. Extraordinary and creative, the Pisces man is often found making a splash in the arts industry. A Pisces man is loyal to friends and family, putting their well-being before his own. He is a compassionate man who can present sympathetic viewpoints when asked by friends and family. Even though he doesn’t normally jump into the role of leader, the Pisces man possesses a powerful, yet restrained disposition and is often called upon by friends, family, and co-workers to lead them through a crucial situation. If there was a Piscean who is misunderstood but expresses his thoughts through writing, dance or song that should be no other than Canadian pop singer, Justin Bieber born 1 March 1994. Bieber burst through the pop scene as an Internet sensation in 2007. Eight years later, Bieber has sold more than 36 million records worldwide. Despite his enormous success, Bieber remains an enigma. Constant brushes with the law have not slowed down his career or his following. Whether Bieber is misunderstood o not, he has a loyal following of 60 million “Beliebers” in Twitter. The Pisces woman is a true dreamer. This is a woman who is always looking for – and finding – deeper meaning, from the grand scheme of life itself to her own social interactions. She keenly observes patterns in people’s behavior and actions and can be quite intuitive as to what motivates them. Ruled by Neptune, the Pisces woman is very intuitive. She is sensitive and caring and considers the needs of others. This imaginative and dreamy woman must determine how she will swim through life: with the flow or against it. Pisceans are kind to their friends – and strangers. At any gathering the Pisces woman will either be the shy one in the corner who will listen to people’s problems or the outgoing greeter who warmly welcomes each individual. Pisces woman is extremely sensitive to the needs of others. In a world of takers, she plays the role of the giver. She feels that she was born to help others. Easygoing and selfless, the Pisces woman will have a lot of friends from all walks of life, all personalities, religions, and ethnic origins. Uniquely perceptive, her understanding of people makes this woman popular within her social circles. Forget the nine to five job because the corporate world is not suited for a Pisces woman. She needs to be able to channel her creativity and when given the opportunity she will put her mind and heart into it. Best known for her suggestive music, videos and liberal, carefree personality pop superstar Rihanna fits the bill as the typical Pisces woman. Born 20 February 1988, people know Rihanna as the chart topping singer who has sold out concert arenas and 30 million albums worldwide. Not much has been mentioned in the press about her philanthropy work; her “Believe” foundation which funds medical assistance for terminally ill children and her work to raise awareness on HIV/AIDS. Pisceans would want to get into a career where they are able to live their dream. They are exceptionally sensitive and creative beings. They envision how they should be living and it is their dream to make it come alive. They are strongly motivated by their inner creative urge, so at least initially they shall strive for job-satisfaction over monetary gains. Their first line of attack usually shall be to get a sense of satisfaction from their accomplished work. Thus, a sensitive Pisces shall always try to maintain an equilibrium between their financial goals and an urge to fulfill their dreams. Pisceans are extremely committed to their work and they master their art so that they can excel in whatever they are into, and eventually they reach great heights in their respective field or career. The contributions of Pisces are very important to accomplish the team’s work. They are creative beings and can think out of the box and so in complicated and tough situations, their contributions are commendable. Pisces are inclined towards charitable work and philanthropic activities and their efforts make the world a better place. Careers include all the caring professions, such as medicine, social work, teaching and community work. Their creativity leads them into all forms of arts– entertainment and media industry, writing and poetry, interior designing, architecture, photography etc. Looking at their traits, one can conclude that they make extremely good partners as well as friends. They believe in sacrifices and going the extra mile to keep their loved ones happy. They can have successful relationships only if their partners or friends are equally sensitive and good-natured. However, if they are involved with someone who is selfish, they can be taken advantage of. This would result in lack of self-confidence and unhappiness in their relationship. For them to lead a happy, successful life, being assertive, coming out of their shell, and being practical, is extremely important. When in Love, Pisceans can be romantic, gentle, understanding, trustworthy, motherly, intuitive, totally selfless and compassionate. However, they can be very frustrating at times. They are never willing to explain their stand and can be very opinionated in their views, which can evoke feelings ranging from passion to anger. They avoid arguments, and are therefore usually the submissive partner in a relationship. Giving makes them happy, and forgiving comes to them naturally. Most of them are soft-spoken and timid. They are generous and sacrificing in nature. A mature Pisces partner is a great mate to be with. Pisces being a feminine water sign, is most compatible with the other two water signs Cancer and Scorpio. Union with Earth signs Capricorn and Taurus can prove to be successful too. It really is best not to link up romantically with the fire signs Leo, Aries, Sagittarius or the air signs Libra, Aquarius and Gemini. The sign of Pisces rules the feet and toes and the mucous membranes. Pisceans are noted for their graceful, well-shaped feet, and many become excellent dancers. Their sense of taste and smell are exceptionally acute. Pisceans tend to have delicate structure that does not easily fight off disease. They are vulnerable to colds, sinus trouble, and water retention in the body. They may suffer from corns and bunions. Ill-fitting shoes are particularly troublesome, for many Pisceans cannot seem to find shoes that will properly fit their sensitive feet. They usually kick off their shoes at the first opportunity and walk in slippers or barefooted. Foods that are rich in iron should be includes in their diet like liver, lean beef, lamb, egg yolks, oysters, kidneys, whole-grain cereals, barley, dried beans, beet tops, spinach, onions, lettuce, raisins, dates, prunes, apricots, peaches, grapes, apples, lemons, oranges. Pisceans function best with a high protein diet that is low in fat and sugar. Lean broiled meat, chicken and fish, natural cheeses, yogurt, and nuts are excellent sources of protein. They should cut down on salt to lessen bloating. Coffee can over-stimulate them and should be cut down to a bare minimum. 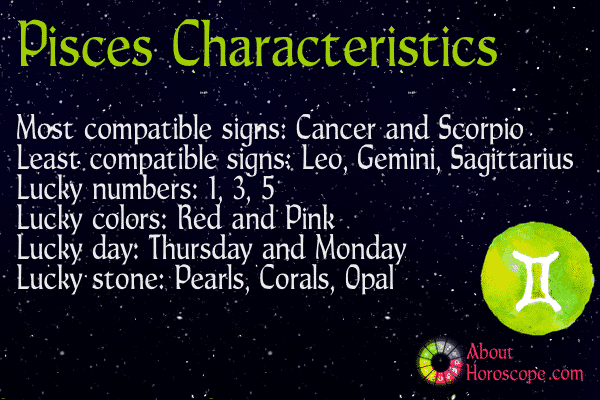 Yellow, red and bright orange colors are considered auspicious for Pisces. Apart from these colors, pink color is lucky. Whenever possible the Pisceans should avoid black and dark bright color. Their lucky days are Thursday and Monday and numbers are 1, 4, 3. Lucky Gemstone for them is the Cat’s eye, which is to be worn as a ring in the ring finger. So are you a “Belieber”…..in our description of what makes a Piscean? If not, please feel free to share your comments at the “Comments” section. We’d like to “fish” more information from you!